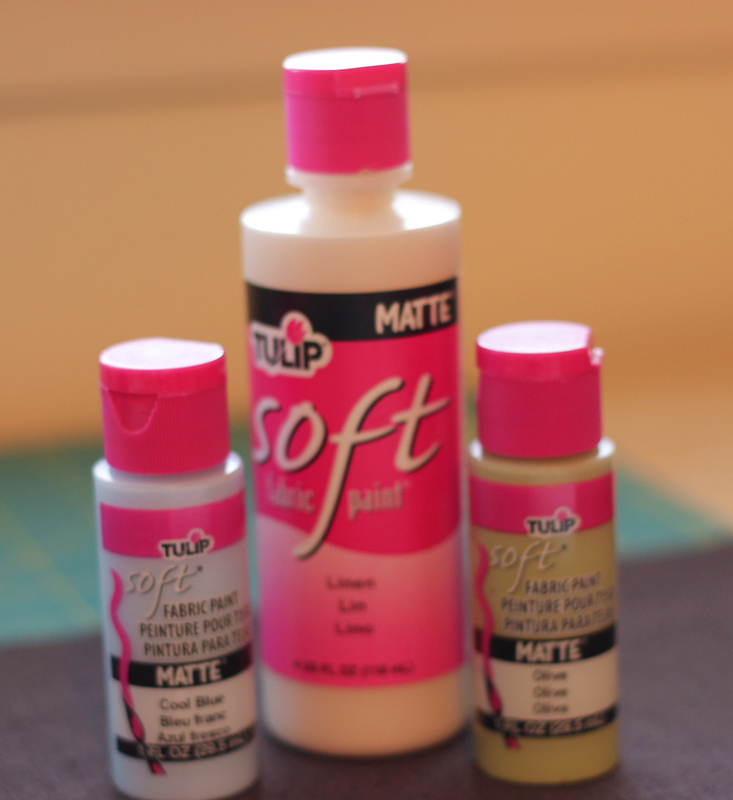 Standard sewing stuff – matching thread, sewing machine, etc. First I decided on a design using tear drop shapes, sketched them on my stamp blocks and carved three separate stamps so that I could use them in a variety of patterns. 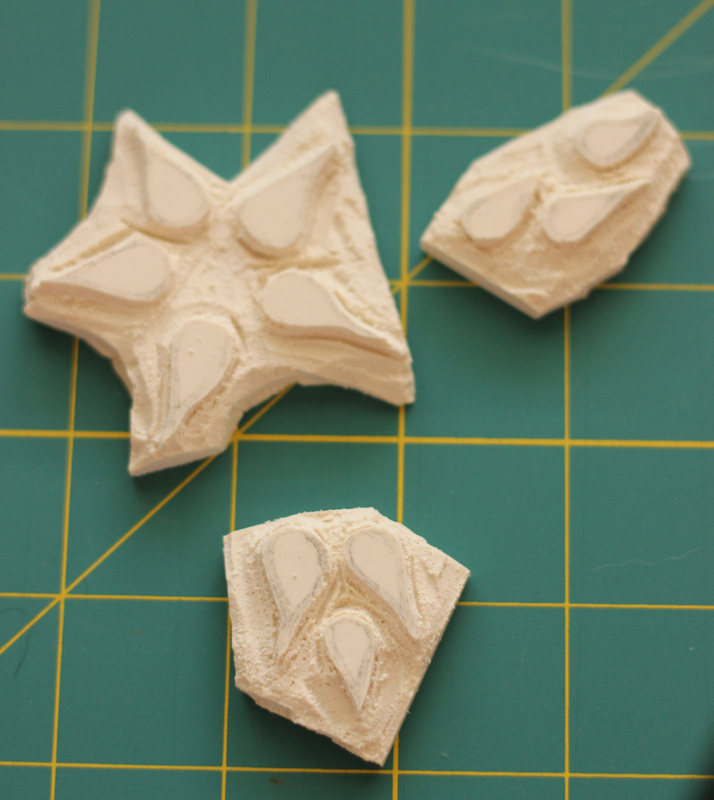 The three stamps I carved, tear drop shapes. 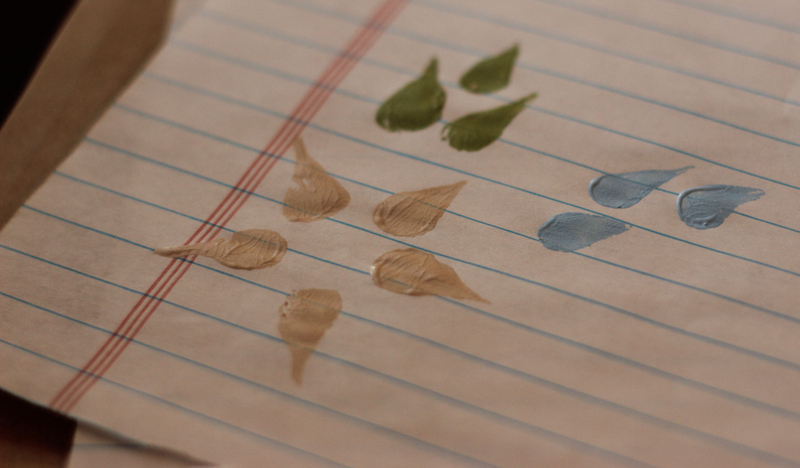 Then, I tested them out on some paper to make sure they stamped well. I cut my knit fabric in half, so that I had two pieces of fabric, 1.5 yards long by 24 inches wide. Because you fold the fabric in half length wise and sew, this gives a scarf about about 12 inches wide (minus seam allowances). I got a nice dark brownish/grayish knit fabric with a small weave. 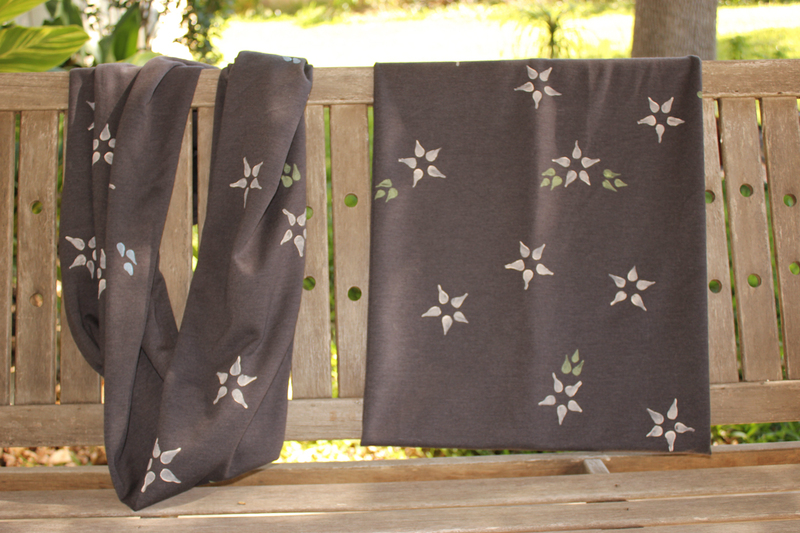 I then used my stamp set and fabric paint to hand stamp a design down the middle of both pieces of fabric. Three fabric paints – linen, light green and light blue. For one design I only used linen and green paints. For the other design, I used all three colors. 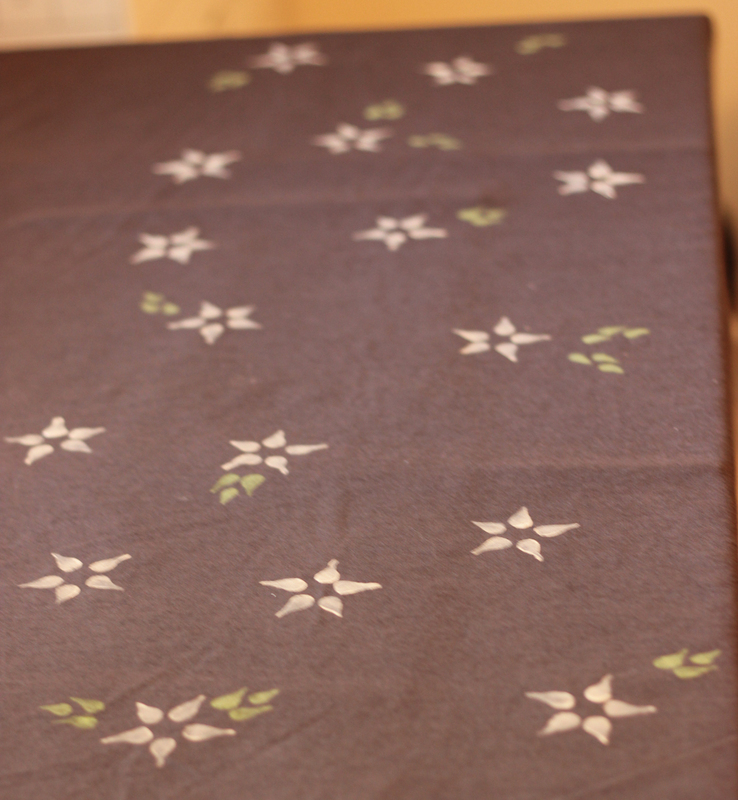 If you do this, make sure to put something under the fabric as you stamp, the paint will seep through in some places. The next step was sewing. The first step to make an infinity scarf is to fold the fabric length wise, with the correct side of the fabric (in my case, the stamped side) touching. 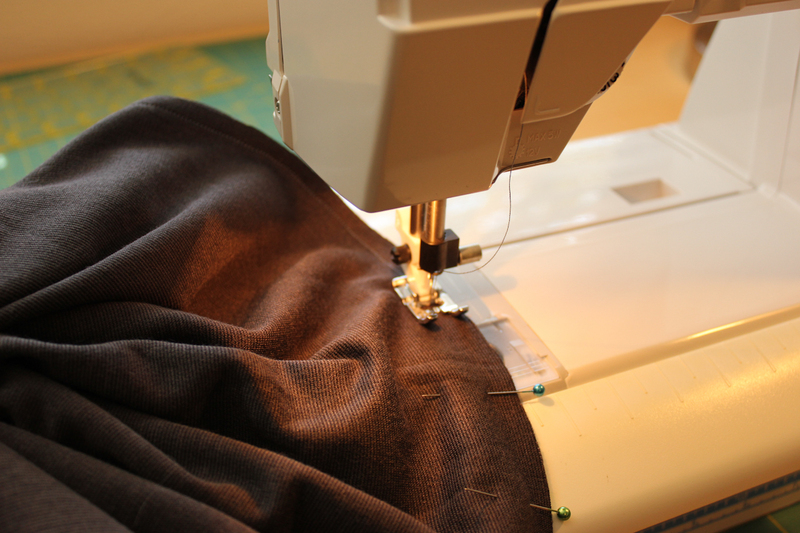 Then pin along the whole length of the fabric, but leave four inches on each side not sewn so that you can connect the loop in a later step. Fabric pinned length wise. 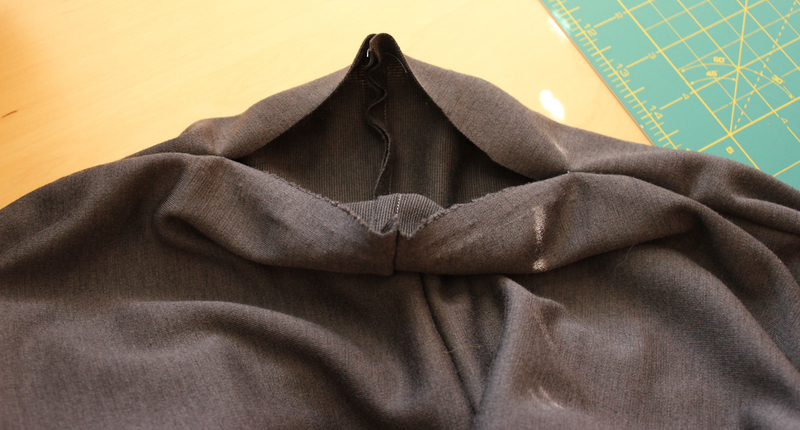 I measured in 4 inches from both ends and used a pin to mark the spot where I would start and stop sewing. 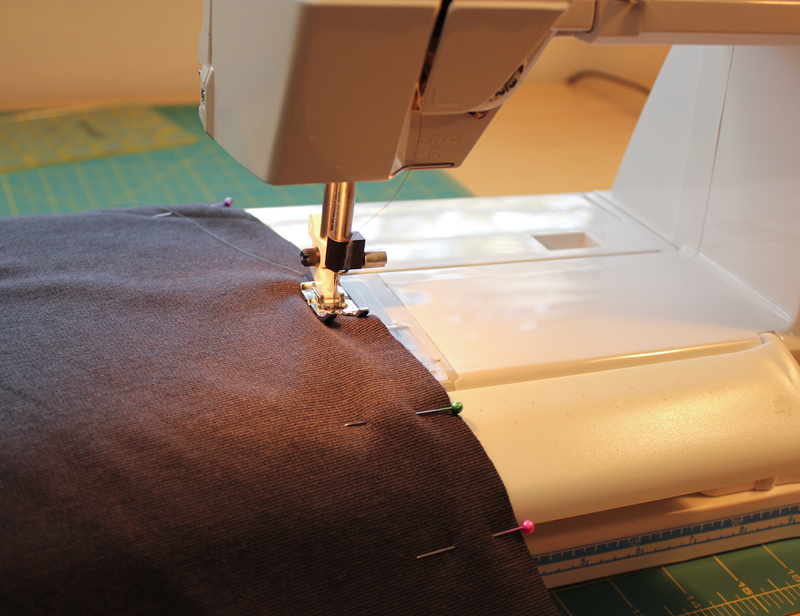 When it comes time to sew, make sure to backstitch a bit on both ends so that your seams are secure! 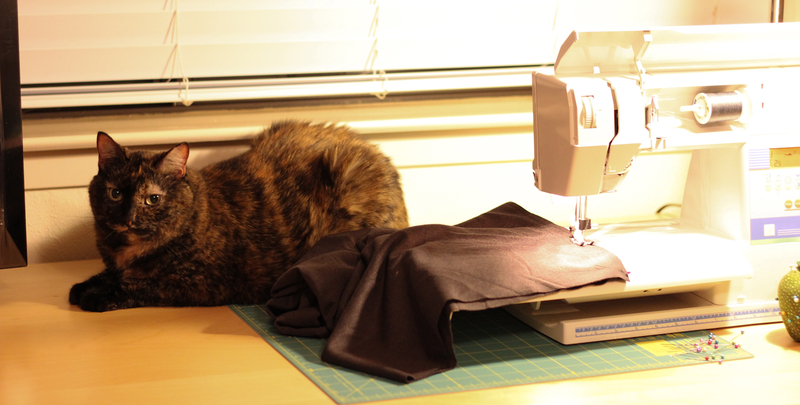 Annie the cat helps me sew. Or really just gets in the way. Remember to start and stop sewing four inches from each edge and to backstitch to secure your seam. 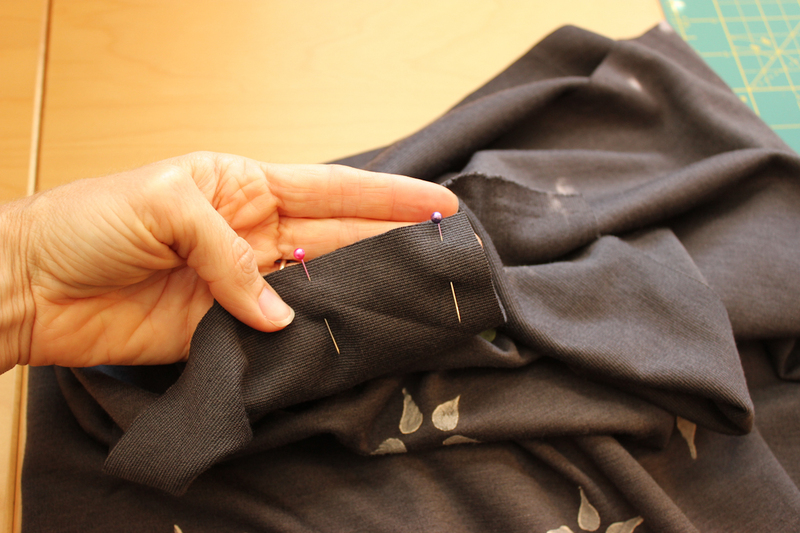 After the fabric is sewn lengthwise, the tricky part begins. Definitely view the video I mentioned above if you are unsure about these steps. 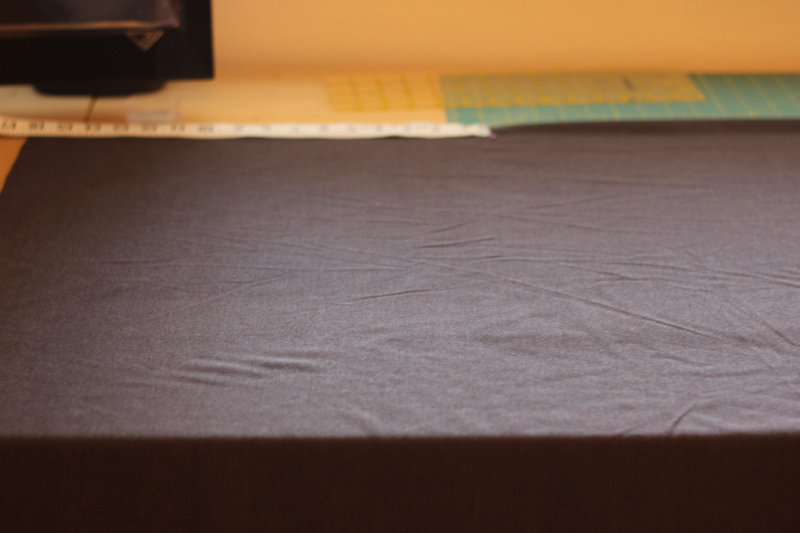 First, turn the fabric so that the correct side is facing out (the way it should be at the end). Notice the four inches that aren’t sewn on either side. Position the fabric so that the seams match and there are no twists in the fabric. Fabric, turned so that the correct side is on the outside. Seam is lined up so that there are no twists in the scarf. 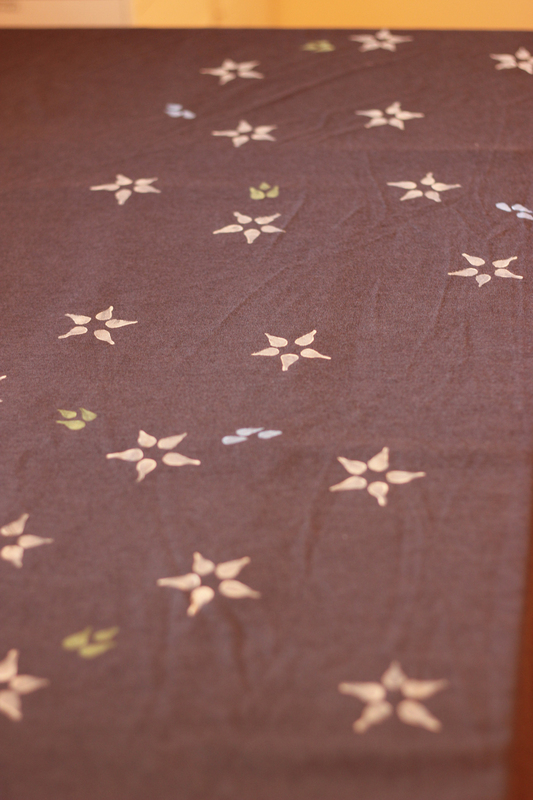 Next, you have to pin the ends of the fabric together, which is what feels a bit tricky. This is the part where you actually join your scarf into a loop. You start with matching corners and keep the correct side of the fabric facing in so that it touches the entire time you are pinning. Continue to pin around in a circle until you hit the other corners. The extra four inches you left on each side of the scarf is what allows you to do this – the rest of the fabric ends up being contained in those 8 inches after you are done pinning. 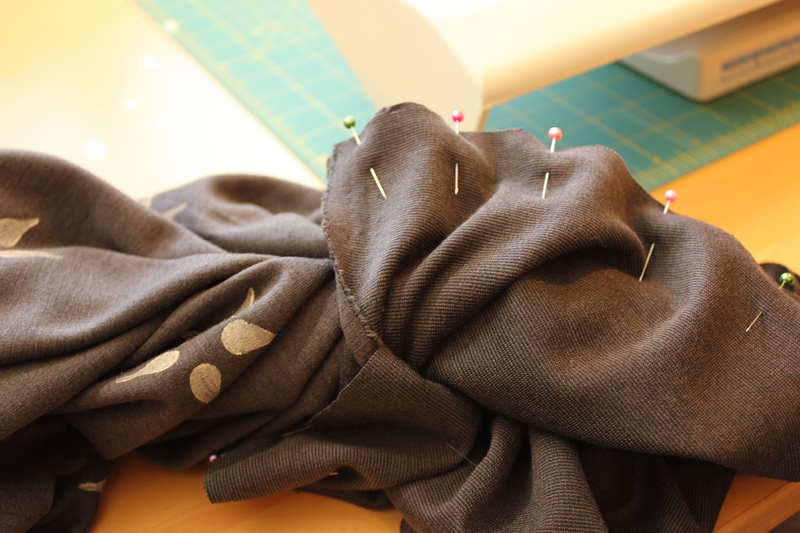 Pin the fabric, starting from matchin corners with the correct side of the fabric facing in and touching. Pin around the entire circle until you come to the other corners. You’ll then see the main part of the scarf coming through the 8 inch opening. That part of the scarf has the correct side of the fabric facing out. Then, you sew. Start at one corner and go to the other. Make sure to backstitch at both ends. Sewing the two ends of the scarf together. When you’re done, you’ll flip that section of the scarf so that the right side is facing out for the entire section. You’ll have an eight inch section left to hand sew to complete the scarf. After sewing the ends together, you’re left with an 8 inch section to hand stitch. Pin the opening closed using the same seam allowance you used on the rest of the scarf. Pinned and ready to hand sew. I used a slip stitch to close the seam, with help of a tutorial from Michelle patterns. 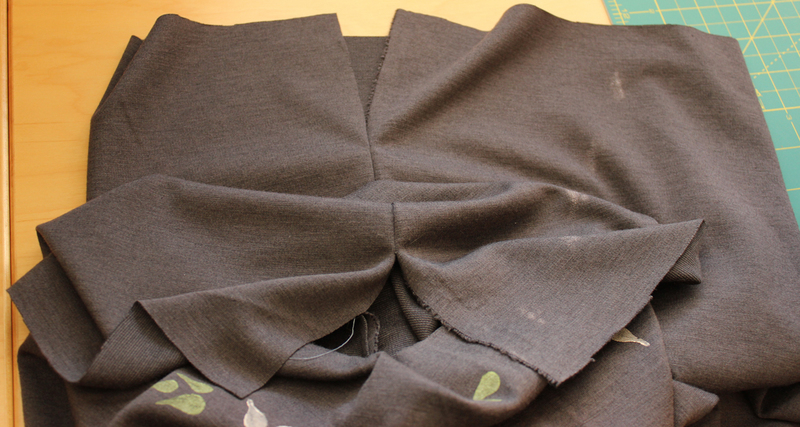 Then, I positioned the scarf so that the seam was positioned in the back. Lastly, I wore the scarf around town. You can see the loop in the scarf on the left and the view of the scarf when it’s flattened out on the right. I’m quite happy with the finished product!